It all started with a leather jacket. After that thrift store find, I was sold. I had always enjoyed garage sales, but they were only on the weekends, and they never had quite the selection to choose from as thrift stores have. When I went away to college, our college town had a Goodwill Super Store that I could stop by any day of the week! Amazing! Today’s project is from another leather jacket. I originally bought this one with a Christmas gift in mind. I thought it would be perfect for this series, but if the recipient were to read this blog, it would ruin the surprise, so I’m making something else. 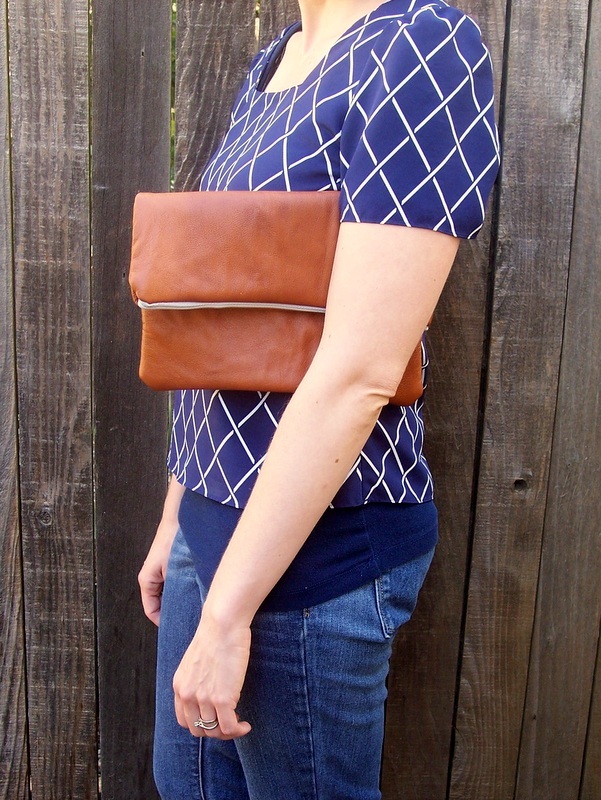 I saw this tutorial a few months ago for a fold-over clutch, and I even bought some bright pink faux leather to make it, but I haven’t gotten around to it yet. (It’s going to have an orange zipper, and it will be AWESOME!) So, as I was brainstorming other projects, this came to mind. I used this tutorial as a guide, but I did a few things differently. I’ll hit the highlights here, but if you wish to try this project, check out the tutorial at Say Yes to Hoboken. I started by cutting off the sleeves of the jacket. Yes, it felt wrong for a few seconds, but then it was okay. I ripped the seam of the sleeves, opening it up to a larger piece of leather. 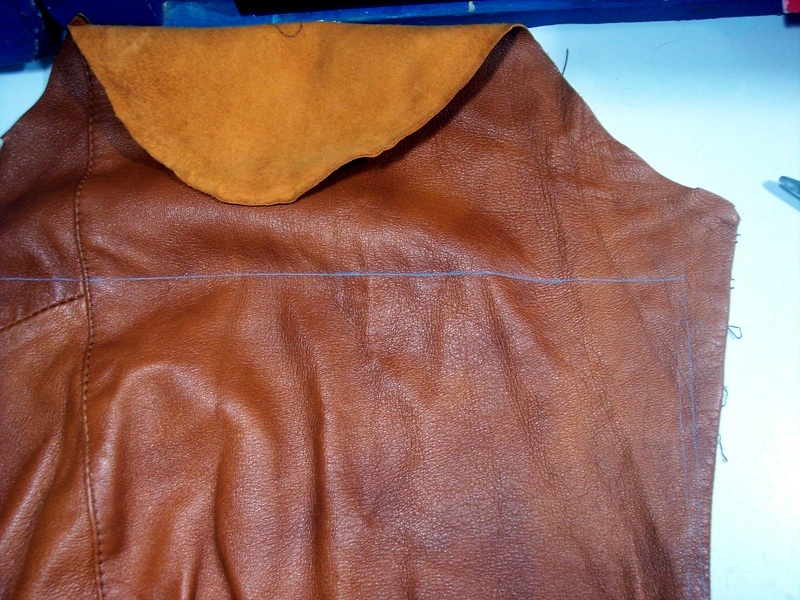 Since these are sleeves, the leather has been rounded and stretched a bit for a little while. 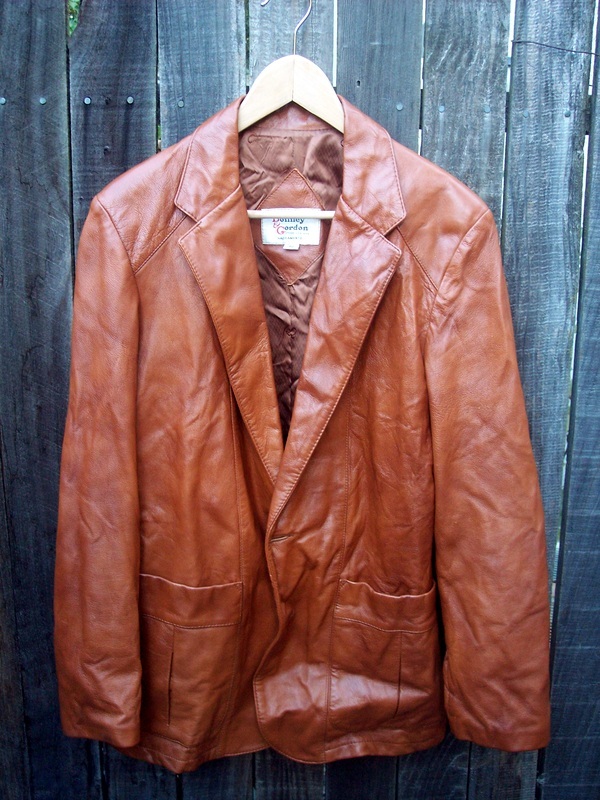 (I’m guessing this jacket is from the 70’s, if not the 60’s.) 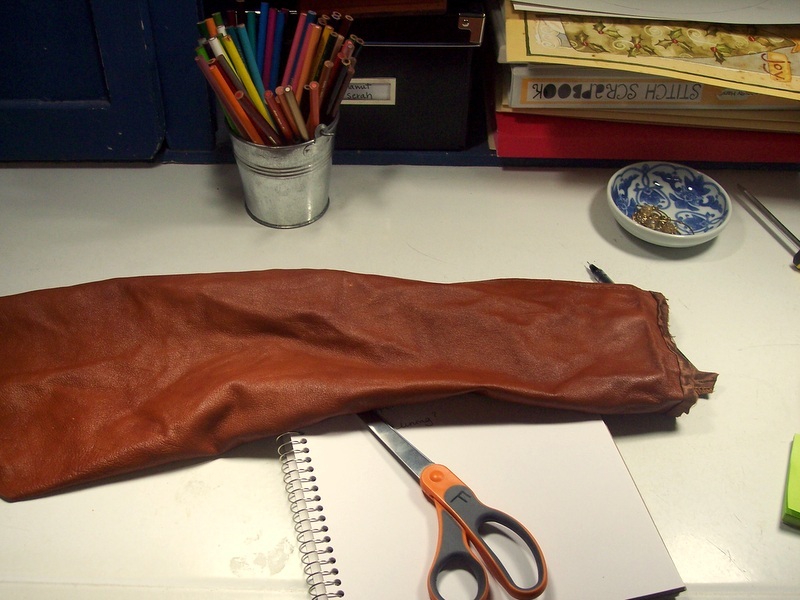 So I quickly Googled, “Can leather be ironed?” Turns out it can, you just have to use a really low setting and place a brown paper bag between the leather and the iron to keep it protected. 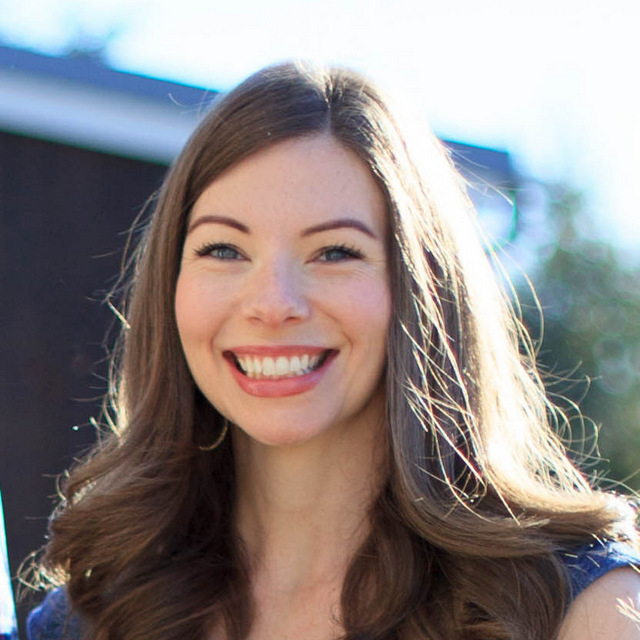 The things you learn by having a blog…. Next I made a template (using the 12″ x 13″ measurements suggested on the original). I used the template to chalk out a rectangle on both sleeves. Then I chalked out two rectangles on some gray felt I had in my fabric stash. 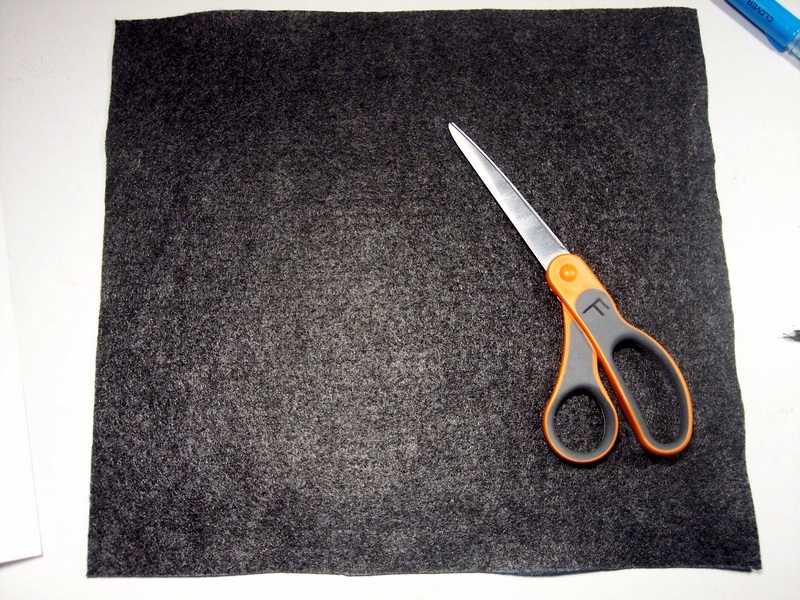 Instead of using the interfacing, like the original, I decided to create a felt lining instead. 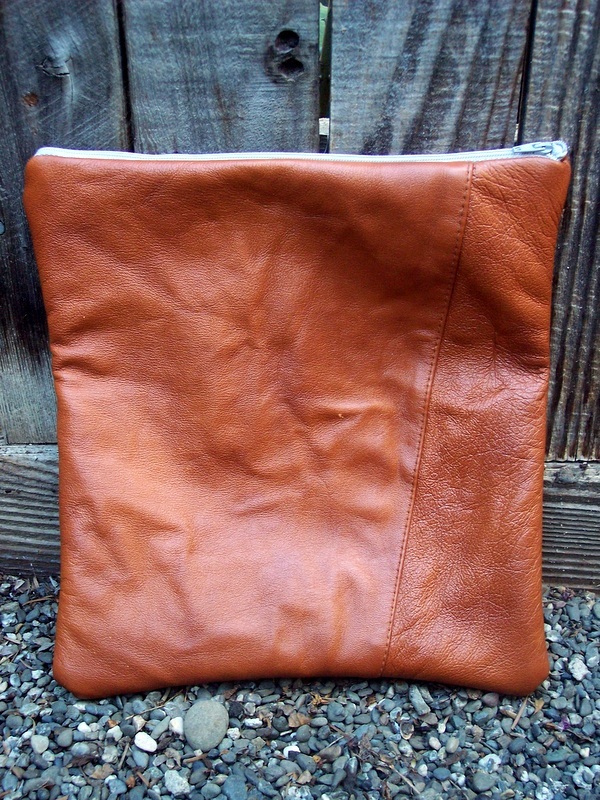 Next I placed one of the rectangles of leather on top of a piece of felt and pinned them together. I repeated with the other sleeve. I don’t have pictures of the next step because I was too busy focusing on sewing a zipper. MY FIRST ZIPPER! It wasn’t as scary as I thought, but I did have to pay attention to make sure I was attaching it to the leather and gray felt properly. After attaching the zipper, I stitched the other 3 sides closed (make sure the zipper is partly unzipped!) and turned it inside out. If yesterday’s Pebble Necklace is my favorite project, this is a close second. I love the way it turned out. And it was pretty easy. After 31 Days is over, the pink clutch will be my first “non-thrift” project. Maybe I need a few other colors, too…. Update: Still haven’t made a pink one, but I made a leopard one and a yellow corduroy one. What can I say? I love a clutch bag. I feel pretty, oh, so pretty! This is genius and I love hearing your story. For the record, I still can’t believe you still have clothes from highschool…only you! again LOVE! you are entering thrifting hero status here! I really enjoyed this entry. My favorite leather jacket is just starting to really get old. I didn’t want to throw it away, so this is perfect. =) The memory still remains. Thanks. Oh, I love that idea! This is amazing! How on earth?! I’m sitting here wondering how I didn’t know this about you! Thanks, Cathy! That’s funny. I didn’t start sewing until college, and only a little at that point, so maybe that’s why. But Dad and I always hit garage sales on Saturday mornings, even when I was a little kid. I credit him for all my thrifty skills. oh, if only I could sew! 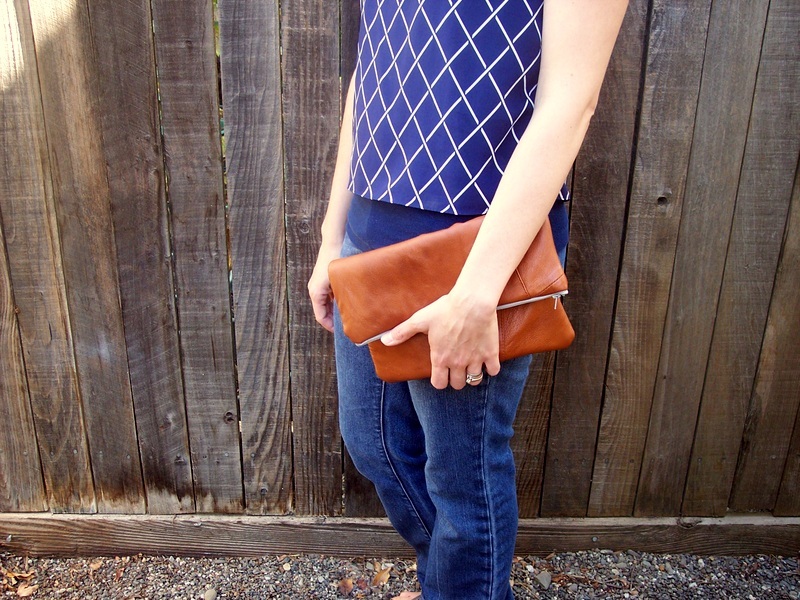 love it and thrift shopping – they have the best stuff! I’m no pro at sewing – I just learn as I go. this is a very impressive project. you are very inspirational, :) i might even get back to my half finished slipcover this afternoon…. I’ve been wondering how the slipcovers were coming along. I really want to make one for a chair I have, but I just sewed my first curve last week, so I’m not sure I’m ready for it. :) Keep me posted! Very smart! A definite hit! Thank you so much! Very sweet of you to check out my little blog. Just came across your lovely DIY via Cotton and Curls. Really like the way you write – like we were just hanging having a coffee. Looking forward to reading more of your exploits. What a sweet thing to say. Thank you, Elena! Very nice. I’m glad to see a thrift-store item used. 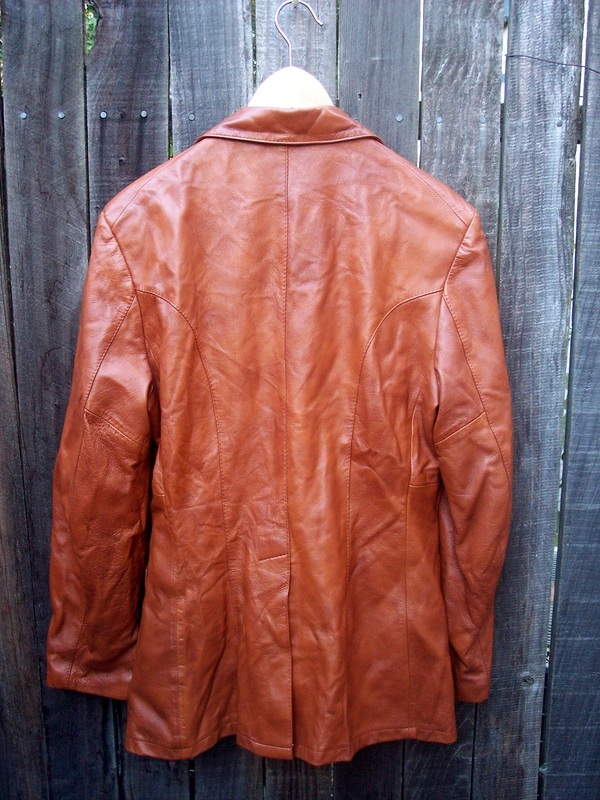 I’ve got a leather coat in my closet too I’ve been wanted to make into something. Would love to hear what you decide to do with it! I think I want to try this but I will probably need the video series of instructions. I will royally screw this project up! It looks so cute! Thank you. I thought I would screw it up, too, but it went pretty smoothly. You should try it! 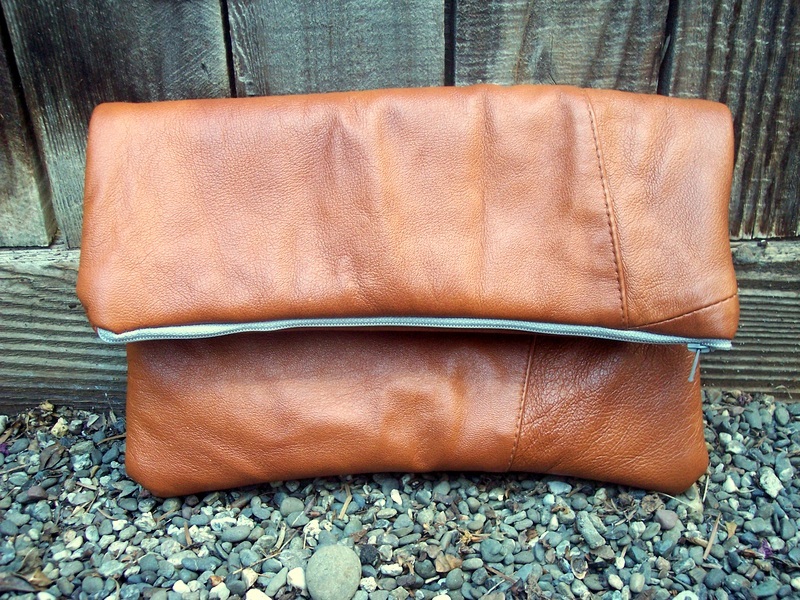 i just came upon this page while looking for diy leather projects (: ♥ your clutch! just wanna check, hand-sewn or machine? 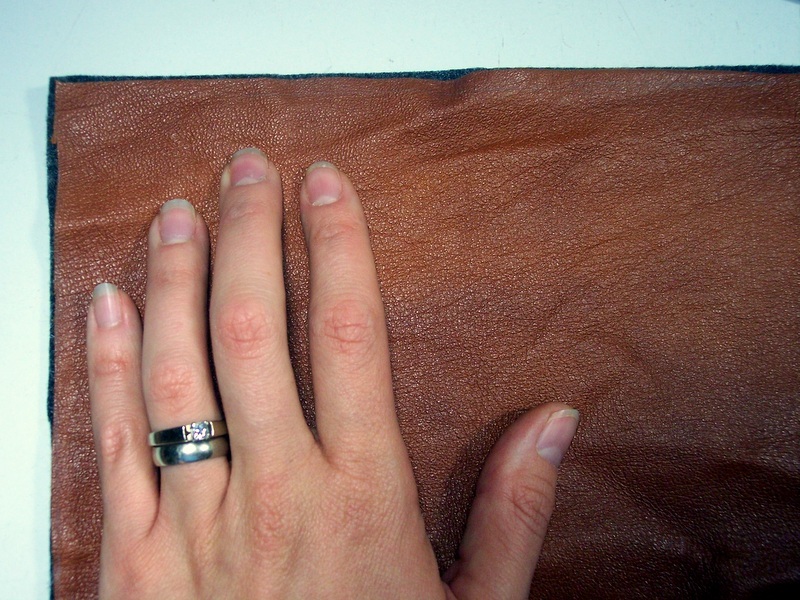 I’m not good with a sewing machine so looking for hand sewing tips for leather materials. What’s the needle and thread used? Thanks! The clutch is machine sewn. I just used all purpose thread (Coats & Clark) and whatever needle was on the machine already, but I do think I could have switched it out for something smaller/sharper.